One morning, you figured out that you can't log in to your blog admin panel. Perhaps, you had forgotten the password, or someone must have messed up with your blog. 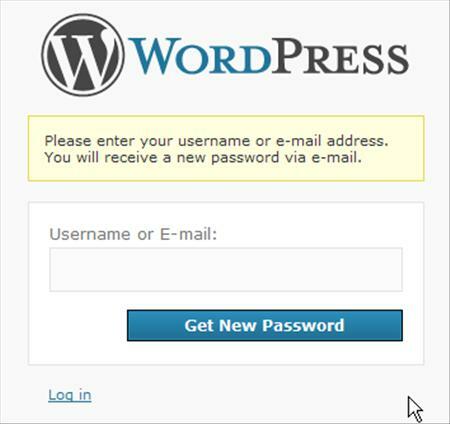 You can retrieve the lost password by going to the WordPress Log In page, and click on the 'Lost your password?' link. On the next page, enter the admin username or E-mail, and click 'Get New Password', as shown in Figure 1. A new password will be sent to the E-mail that you specified during the registration process. If the above method fails. You can also reset the password using the phpMyAdmin tool. Open the phpMyAdmin tool via cPanel. Once you are in phpMyadmin, select your WordPress database, from the left menu. Next click on the SQL tab, which is located at the top. Paste the SQL code below, inside the text area. Replace 'your new password' with the new password, and 'the admin username', with the existing username of the admin account. Please refer to Figure 2. I hope that this article will benefit those who lost their blog password. Good luck. Thanks for the info. It worked and really helped.